It might be a little early to start making predictions regarding Wisconsin's 2012 white-tailed deer hunt but I'm so excited! I just had to write post about it. 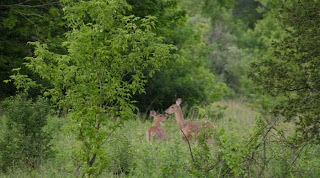 I've been thinking a lot about nature, deer and wildlife in general because I love the outdoors. I realized the other week that I've been seeing tons and tons of deer. Actually, I've been seeing an unusually large amount of deer this year. So, I'm going to go out on a limb and propose a theory as well as make a few hypotheses about the 2012 Wisconsin Deer Hunt.